You and your friends can sign up for the race as a Church Team and compete in the Church Challenge! Friendly competition with a big traveling trophy up for grabs! Details can be found in dropdown menu! 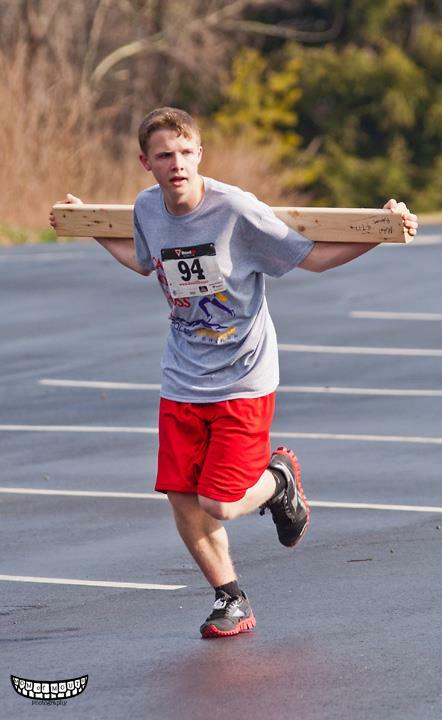 This a unique race, suitable for the whole family, held on Easter weekend where you actually carry a 4ft length of 2x4 lumber across your back for the final 2/10 of a mile uphill! Looking to be challenged physically and spiritually? Come join us for a run that you won't soon forget. 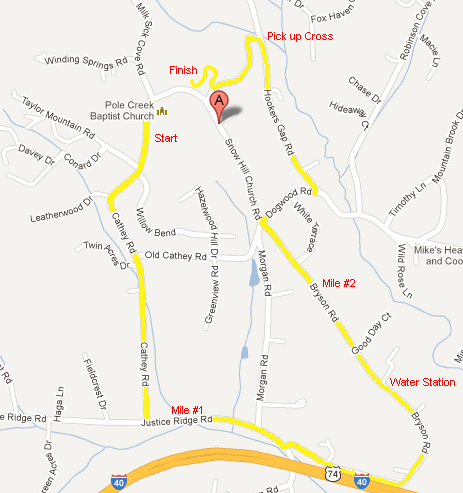 Race starts at Pole Creek Baptist Church: 96 Snow Hill Church Rd. You start on Cathey Rd. Turn Left onto Justice Ridge Rd. Turn Left onto Bryson Rd. Turn Right onto Dogwood Rd. Turn Left onto Hookers Gap Rd. Event Mercenaries uses the ChronoTrack Timing System to provide professional chip timing. Additionally teams of 4 will compete for top 3 in the Church Team Challenge. And top three male and female finishers (under age 12) in the Kids 1K will also receive awards. Performance t-shirts printed by ooshirts.com. You may pick up your packet in the Family Life Center (Gym) at Pole Creek Baptist Church on race day between 7:00am and 8:45am.